openhagen University, Department of Arts and Culture Studies, Watermill Center, New York and Robert Wilson, The Dramaturgical laboratory, Entrescenen (Århus) and UNITS (Kanonhallen) at Kigkurren, Copenhagen. We are always looking for sponsors and collaboration partners - both in professional and economical purposes.So please do not hesitate to contact us! - We deliver the story board, the digital framework and know how. - You deliver local dancers, interested digital artists, supplementary technique, technical staff and 14 days for rehearsals. You, Me, and The Others consists of an approximately 40 min. performance, followed by a presentation of the ideas behind the project and a proposal for a discussion with the audience. The showcase, like the laboratory, is unique to each occasion and inspired by the individual collaboration partner, adapting the performance to the environment in which it is performed. This means that the showcase incorporate the locations, the individuality of the local dancers, and the abilities of the local artist and technicians into the framework we have developed. - What does all these new ways of communication do to our physical relations? - Can we grow friendships, and have intimacy and presence in such environments? - What happens to our relations, when we can establish them without being physical present, through net-dating, blogs, communities, chats etc.? You, Me, and Everybody Else focuses on increasing the experience of the audience. The tools used are a variety of screens on stage, cell phones, and laptops. The audience is invited to bring their own cell phones and laptops to the showing. During the performance the complexity of the plot is built up through live streaming from camcorders on stage, offering alternative and intimate views via a local network, video, text messages, phone calls, and access to a web page with parallel information. The many cell phones, camcorders, web-cams, screens, televisions and Internet tools we rely on in every day life, provide us daily with new communication and information platforms. These tools challenge the experience and distinction between fact and fiction; they change our understanding of boundaries between public and private space, and they provide us with an entirely new means of experiencing the world around us. In an attempt to create a contemporary expression for the stage, the REALstAGE laboratory brings together the daily technical communication tools with the stage and its artistic expressions, creating a stage form where the communication tools are used to tell a story, just as easily as in our normal lives. The vision of the REALstAGE laboratory is to develop a new stage form by incorporating communication technologies from every day life as a part of the stage space (architecture/set design) and stage expression (choreography). REALstAGE seeks to link the different communication technologies, such as cell-phones, camcorders, projectors, and the Internet into the traditional theatre space, creating a space consisting of real and virtual platforms for the artistic expression. We want to establish direct, individual lines of communication to the audience through cell phones and the Internet before, during, and after the performance. The expanded space that relates to and is structured by the logic of the “zap” culture – quick changes of focus and interactive information streams. The breakdown of the boundaries between the public and personal space, via visual communication technologies, intimate presence and communication in the public space paired with the intrusion of the publics space into the private sphere. New potential lines of communication arising from the meeting of live and taped presences. 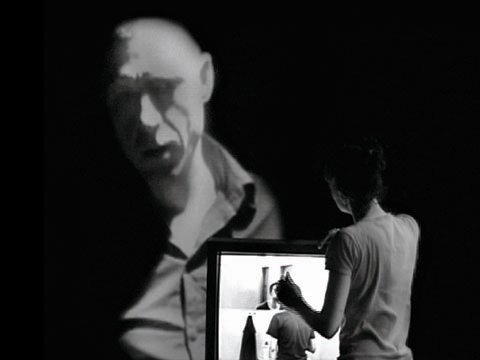 The consequence for both the audience and the performer, of real and virtual presences in the space. The REALstAGE laboratory experiments with the development of a new stage expression by the incorporating of every-day communication technologies such as cell phones, camcorders, and Internet into the stage expression. The communication technologies are used to break the physical boundaries of the traditional stage by establishing new points of contact – virtual and real – between the audience and the performer. REALstAGE explores what such an expanded and mobile stage space does to the stage expression in general, the choreographic expression specify cally, and to the experience of the audience. The REALstAGE laboratory has been working since 2005. A focal point is the collaboration with the Watermill Center, New York and Robert Wilson. REALstAGE was, on invitation from Robert Wilson, part of the Watermill Center Summer Program 2006 and 2007. Other collaboration partners has been Copenhagen University, Depart ment of Arts and Culture Studies, Dance and Theatre Research Section, the Dramaturgical laboratory, Entrescenen (Århus) and UNITS (Kanonhallen) at Kigkurren, Copenhagen. Christina Back is educated at the Royal Danish Academy of Fine Arts – School of Architecture with specialization in perception. Through the last 9 years she has worked with space in relation to installations, performance and exhibition design. Her expression and work is found on the border between architecture, installation, light, movement, video, sound and interactivity. Helle Bach is educated at the Ballet Academy of Gothenburg, Sweden and Menagerie de Verre, Paris, France. She has been choreographing since 1997 and is the artistic director of the dance company dadadans. Her original approach to choreography gives a universe that mirrors the off beat, poetical and ironic within us. Based on a joint vision for a future theater, Christina and Helle established REALstAGE in 2005. They have been collaborating since then on furthering their ideas. The variable platforms through which the story can be told. 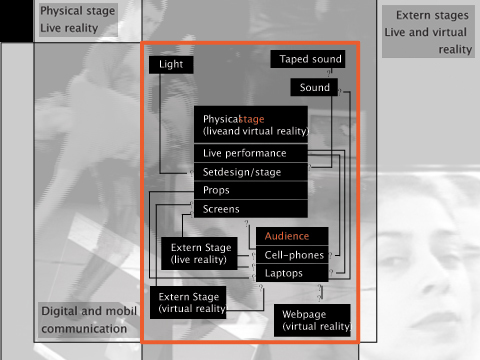 The illustration to the right shows the REALstAGE space is defined between The physical stage, The extern space and Digital and mobile communication. REALstAGE – establishes direct and individual contact between the stage and the audience. Cell-phones, laptops and the Internet are used to create a web of communication lines - before, after and during the performance. - Creating a stage experience that is pieced together by the choices of the individual audience and that allows the performers to exist on different platforms simultaneously in time and space. The showcase You, me and the others is a tangible introduction to the ideas and structures developed by the REALstAGE laboratory – giving an example of how a story can exist and expand within this new stage expression.